First Sergeant Dombrowski is a full time motor officer assigned as the unit commander of the New Hanover County Sheriff's Office S.A.F.E. (Sheriffs Alcohol Field Enforcement) Unit. 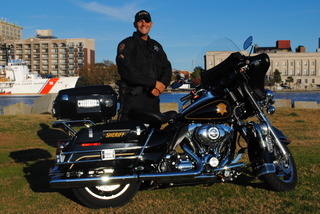 First Sergeant Dombrowski has attended multiple Police Motor Officer training courses that include courses through Cape Fear Community College and Northwestern University. First Sergeant Dombrowski is also a certified Police Motorcycle Instructor through Northwestern University.